Kid you must come back up to Glasgow again! I am pushing the Mini Album out to all the social sites I frequent, so here’s hoping you get someone who can get the helicopter option sorted for you! heyy ed (kid capet) im alfie the one who you took a picture with at t on the farm and you signed my t shirt whats your email??? Hello, We’re thinking we may take our 7-year-old, who loves your CD, to see you in Aldershot. Is your show suitable for children this young? Thanks, Rhodri. Hi Rhodri. the show is aimed at 3-8 year olds so it’s perfect for your little one. they may even win the dance contest? Welcombe Children’s Group would like to thank you very much for coming down to deepest Devon with your show. It was a fantastic performance and we all really enjoyed it. The adults got as much out of it as the children. We would recommend it to everyone! The school run was highly entertaining today with the CD keeping us all singing along! Gutted that you’re not coming to Glasgow, just found you when I heard you interviewed on the radio this week – so brilliant!!! Our 4 year-old boy won the dancing competition in Aldershot, shyly declining to proclaim his ego, and has been singing “Gorilla!” ever since. Thank you for a singularly wonderful experience. Been meaning to post this for a while. We saw you at the afternoon performance at the MAC in brimingham- I was the one struggling with the grumpy 10 year old in the wheelchair -I was thinking I may have had to abandon ship if he didn’t calm down but right from the first G of Gorrilla he was hooked – as was my 6 year old (and my mother!) 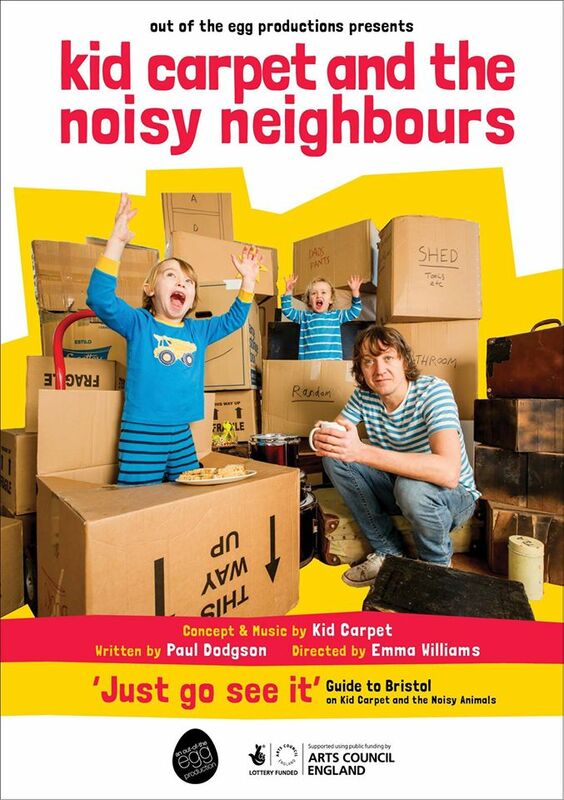 A truly brilliant piece of theatre and totally beguilling for kids. I find myself playing the CD even when the kids aren’t in the car! hi Sharon, thanks for the lovely post. Ah Boo! She may well have to make a slightly more genteel trip to Malvern then. Just to say also that my son, (hey let’s give him a name eh? He’s Tom) now won’t let a car trip go by without your cd. He has very few words and usually ‘observes’ the music rather than joins in but I can safely say he has parts of virtually every song that he sings along with. His ‘Nowwww’ in The Good Bit is hilarious, as is his well timed ‘Yess’ in I Am A Badger’. Think I may just have to come along to Malvern as well at this rate! We came to see you in Ipswich yesterday – it was fabulous – my 6 year old daughter loved it very much and even persuaded me to buy your cd – which we put on straight away in the car then she listened to it in bed last night – obviously our favourite song was the poo in the forest! We have the exact same gorilla here so he has been upto all sorts of adventures here!! thanks Helen. we had a great time in Ipswich yesterday, both shows were really fun. Are you playing at Bristol Harbourfest? i’m in manchester on saturday with my kids show. anyhow, no invite to play…. Are you interested in playing on Sunday 28th July as part of the Bristol Harbour Festival as a headliner on the ss Great Britain / BBC stage? We’re trying to keep the family friendly vibe we had last year and you would go down a storm! i think we’ve booked in to go away for the weekend with family. but just in case, what would the crack be with times and fee etc? i’ll mail you and do my best to sort out a MAIL ME button or suchlike. More dates please!!!!!!!!!!!!!!! Come on. How soon? 🙂 would love to see you at mac in Birmingham again! definitely coming to warwick arts centre in december. not sure if mac have confirmed or not yet but i’d love to return there. was wicked last time. could you ask them to get us back….? Any idea if your at Sale arts centre again soon? We came to the show on Saturday and my four year old was in heaven. He’s been obsessively singing Super Duper Space Rocket ever since. Thanks again! Any news on where the Wales dates are going to be – I have a 5yr old who loved you in Narberth and would love to see you again!? Not yet, sorry. Nightout.org.uk have booked the show but not yet decided where to put us. I’d love to play Narberth again but it’s up to them. If we both mail them perhaps they’ll decide that Narberth is the place? On it like a comet! Thursday 21st November – Most likely a venue in Cardiff – will advise as soon and we have it confirmed. I promised my wife I would write to you ages ago. I fear I may have left this too late. To summarise, back in October my little boy asked Father Christmas for some “rocket boosters”, but we as parents thought that the big guy might deem this undertaking I feasible or fraught with danger, and so we instead bought tickets to come and see you perform the Blast Off show in Reading this afternoon. Consequently, if a little blonde boy or girl (his sister) comes up to you today, asking if you are one of Santa’s helpers, please could you nod knowingly? A grateful mummy and daddy. You and Chris were great! My girl was the one who came up for an autograph at the end. Thanks Kid Carpet! Hi. You’re not going to get many sales at the Fareham venue as it doesn’t show it on the booking page of its website! new and improved ticket link for Ashcroft arts centre! Erm……can’t see Bristol on the list. we did Bristol Old Vic to kick the tour off as part of Mayfest. should be returning in October.